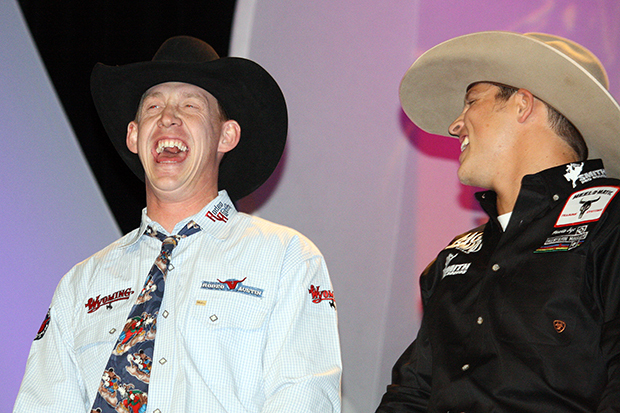 Saddlel bronc riders Chet Johnson, left, and Bradley Harter laugh while on stage at the contestant introductions Tuesday night. LAS VEGAS – While the Wrangler National Finals Rodeo features the very best 119 contestants from the 2013 ProRodeo season chasing their gold buckle dreams and their share of the most lucrative purse over 10 days in the Nevada desert, it also is time to celebrate the sport. This is the craziest two weeks of the year and began two days ago with the Gold Buckle Gala and continued Tuesday night with the Welcome Reception and contestant introductions. It’s all part of the Professional Rodeo Cowboys Association annual convention, so rodeos from all across the country have converged on the City of Lights for this. Wednesday night is the awards banquet, where many friends will be rewarded for a year’s worth of hard work. I hope to bring you as much information as possible over the course of the next 11 nights. You can view photos from Tuesday’s reception, then continue to check back on the TwisTED Rodeo Facebook page for more throughout the duration of the NFR.